“De Profundis”: the expression is usually encountered in the original Latin, so much so that you don’t even reflect on its meaning, but, litterally, it means “out of the depths”. 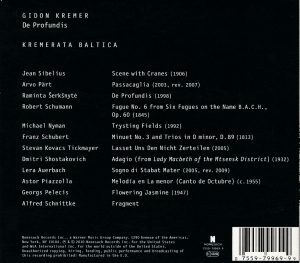 Kremer wrote himself the little essay which serves as liner notes and explanation of the disc’s meaning. Dedicated to Mikhail Khodorkovsky, the former Russian oil mogul who was arbitrarily jailed in Siberia by Putin and his judicial henchmen, it is a cry of protest against those the “worshippers of the golden calf”, “drunk on oil” and seeking “to silence opposition and build walls between peoples and states”. To those, Kremer opposes “we, the worshippers of Art”, who “believe it is our duty to build bridges and to stand up in support of those who are tying to establish a more democratic society, those who are fighting for transparency and truth”. Incidentally, Arvo Pärt dedicated his 4th Symphony, premiered in January 2009, to Khodorkovsky as well. The title, “Out of the depths”, refers both to oil (“a hidden substance extracted from the depths of the Earth than can both sustain and destroy life”) – presumably, an oblique tribute to Khodorkovsky also – and to the artists who “cry out for a better world, one that is not dominated by the superficiality of sales, figures, ratings, self-promotion” (although I’m sure Nonesuch wouldn’t mind if those came on top). So, despite the fact that Kremer concludes that his intention is not to make a political statement, “for politics represents only the surface of things”, this is indeed a political statement – no criticism implied: politics, in the most noble sense, the sense of the founders of Democracy in ancient Greece, is the concern for public affairs. I see nothing superficial in it. What is not so clear is the relation between the selected music and the message, other than the fact that one of them, the composition of Raminta Serksnytè, track 3 (OK, go ahead, try to pronounce it), bears the disc’s title. 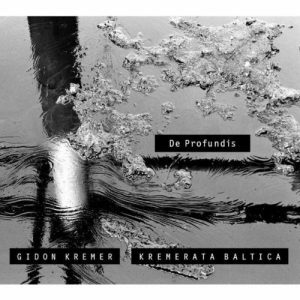 It could have been titled “De Profundis – Gidon Kremer and Kremerata Baltica play music for strings from Schubert to Šerkšnytė” just as well, but that may not have been such an effective attention-puller. What you get is a recital of music for strings (with the addition of two clarinets in Sibelius’ Scene with Cranes, harpsichord in Schnittke and vibraphone in Lera Auerbach’s “Sogno di Stabat Mater”, track 9 and in Georgs Pelēcis’ “Flowering Jasmine”, tack 11) from Schubert (the little Minuetto No. 3, track 6) and Schumann (Fugue n° 6 from Six Fugues on BACH, track 4) through Sibelius and Shostakovich to, mostly, contemporary, with many Balts: Pärt, Serksnytè (Lithuanian she, born 1975), Pelēcis (Latvian, born 1947). Add Schnittke, Nyman, Piazzola, the Russian Lera Auerbach (born 1973, she) and Serb Stevan Kovacs Tickmayer. Sibelius’ Scene with Cranes is one of those atmospheric, arch-lyrical adagios that belongs to collections with Barber’s and the Adagietto from Mahler’s 5th, Schumann’s 4-part Fugue (originally for organ, author of the transcription uncredited) sounds like a fugue from The Art of Fugue played by string orchestra and only in the last minute does it sound like gorgeous Schumann. Depending on how you listen, the Schubert Minuetto could be an inconsequential and charming little viennese march, or a funeral march. The Shostakovich piece is another brooding adagio from his opera Lady Macbeth of Mzensk. The contemporary pieces present an alternation of the kind of atmospheric but easy-listening and excessively “pretty” new age / world-music / film music compositions that are so fashionable these days (the pretty and plangent Nyman, the pretty, wistful and folk-like Pelēcis, Piazzola’s brooding and wistful “Melodia”, the lively Tickmayer – his short piece sounds like an arrangement for strings of a Bach “Courante” -, with Pärt’s obsessive, intense and funeral Passcaglia being in fact quite effective) and more demanding, grim and dramatic but equally atmospheric compositions: Šerkšnytė, Auerbach (her fine “Sogno di Stabat Mater”, with its quotations of Baroque music and specifically of Pergolesi’s Stabat Mater, sounds like a piece Schnittke could have composed), and the superb, grim and tragic Schnittke fragment from an unfinished Cantata. TT 77-minutes. Other than Kremer’s text, there is no information on the composers and compositions, which is regrettable. You need to check on Lera Auerbach’s own website, for instance, to understand that “Sogno di Stabat Mater” is apparently only a 12-minute excerpt of a 39-minute composition called “Dialogues on Stabat Mater”, premiered in 2005 by the same forces who have recorded it here. Nonetheless, the recital is quite appealing and offers some fine discoveries. And if buying it can help the restoration of democracy and of the rule of law in Russia and the liberation of Khodorovsky (P.S. : it happened after this review was written, so maybe the CD had an effect after all), or just the aggrandizement of one’s soul, why not? P.S. : this review as posted on Amazon.com initiated a small controversy, athough it was, much to my regret, rapidly cut short. But I find the exchange interesting and I’ve taken the liberty of transferring it here. For more about the composers featured here and access to more reviews, see their respective introductory page: Sibelius, Pärt, Šerkšnytė, Schumann, Nyman, Schubert, Tickmayer, Shostakovich, Auerbach, Piazzolla, Pelēcis, Schnittke.